Supervisor Steve Gallardo was born in Phoenix, Arizona. He is a fourth generation Arizona native. In 2002, Supervisor Gallardo was elected to the State House of Representative in a new legislative district covering the southwest valley. In October of 2001, Steve Gallardo was appointed to the Cartwright Elementary School Governing Board to fulfill an unexpired term and then later elected in 2002 and in 2010 for a 4-year term. Supervisor Gallardo currently serves as the Governing Board President of the Cartwright Elementary School District. In 2004, He was elected to the Phoenix Union High School Board to the at-large district position and left Phoenix Union to run for the Arizona State Senate. 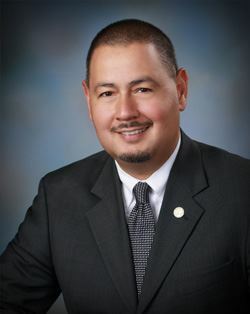 During his term as State Representative (between 2002 - 2008), Supervisor Gallardo served as the House Minority Whip. In 2010, he was elected to the Arizona State Senate and in 2013 was selected to be Senator Democratic Whip. As a State Senator, Gallardo provided a bold leadership and strong voice. Steve raised the community alarm on HB2305, the tea party's misguided attempt at voter suppression. He also was the loudest voice in the legislature against the infamous SB1070 which unfairly targeted all Latinos regardless of citizenship status. In 2006, Steve Gallardo was the Chairman of the successful ballot initiative to create a state minimum wage in Arizona. Supervisor Gallardo has spent his life working to make government work for the people. He spent 14 years working as a campaign finance administrator in Maricopa County Elections Department. He developed candidate training programs, spearheaded voter registration drives and organized "Get out the Vote" campaigns. He has been involved in numerous boards and commissions, including the Arizona Civil Right Advisory Board and Maryvale Village Planning Committee. Steve is very involved with the local and national Hispanic community and served as a member of such organization as NALEO (National Association of Latino Elected and Appointed Officials), LCLAA (Labor Council for Latin American Advancement) and an MALDEF alumnus (Mexican American Legal Defense and Education Fund). Supervisor Gallardo was elected first elected to the Maricopa County Board of Supervisors in 2014 Special election to serve out the remainder 2 years due to a board vacancy. In 2016, Gallardo was elected to a four-year term. Recently, he was elected as the 3rd Vice-President of the County Supervisors Association. Steve, also is a member of the NACo Large Urban Caucus, the Ryan White Policy Board, and the Regional Planning Transportation Association.